Known as "Nature's Little Secret", the British Virgin Islands make a popular destination choice for your private and fully crewed Caribbean yacht charter vacation. 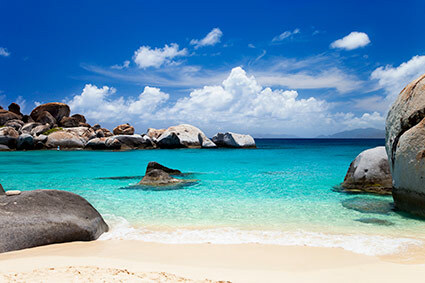 Why Charter a Crewed Yacht in the British Virgin Islands? Plenty to do and see: With over 40 islands, islets and cays, guests can enjoy new islands each day, each with their own character and charm. First timer and family friendly: BVI charters are ideal for first timers or a family charter with their protected waters, easy sailing, plus variety of excellent anchorages. Abundance of yacht choices: The BVI offers the most yacht options of any destination. Choose from our extensive lists of catamarans, power catamarans, monohull sailboats and luxury motor yachts. Unique Snorkeling & Diving: The BVI features world-class snorkeling, often right off the back of your yacht. Divers also enjoy her easily accessible and diverse dive sites. Best Beach Bars: The BVI offers some of the best beach bars in the Caribbean, enticing groups of couples and adult family members back year after year. Luxury and value: Most of our BVI yacht charters are inclusive of meals, beverages, plus standard bar. Learn more about the chartering experience and luxuries aboard. How much does a luxury BVI crewed catamaran charter cost? The majority of our luxury crewed catamaran charters are all inclusive, starting at around $15,000 per week and up to $65,000 per week, plus tip.​​ Learn more about our crewed yacht charter costs. Crewed Yacht Charters BVI Video Watch a short video featuring 52' Catamaran Stop Work Order, her crew and the BVI. She's one of our favorite mid-range, luxury options for families, couples or special occasions. Why Choose Carefree Yacht Charters®? Our Experience Makes Us Unique: We've been a top 5 BVI & USVI Broker for 6 years and offer our clients 24 years of key industry experience. Our tenure includes 12 years in business exclusively as professional brokers plus 12 years as crew aboard our own successful crewed yacht in the BVI, USVI & Caribbean. Our Client Experience Sets Us Apart: Our clients rely on prompt, honest and sound advice, a strict adherence to ethical and fiduciary responsibilities, an in-depth knowledge about the yachts, crews, and destinations we recommend, plus a Carefree Charter Process that results in trips of a lifetime, time and time again. Check out what our clients said About Us. Call us in our South Florida office at 954-980-9281, Toll Free at 888-670-6884, or complete our Quick Request Form. We'll match you with a charter that fits your budget, style and interests. Or, get started by viewing a sampling of our popular BVI yacht charters. Ask us about our dinner and stay aboard in May, 2018! Winner of Best in Show at 2017 BVI Crewed Charter Yacht Show! Ask us about this crowd pleasing crew! Best Crew Award at 11/2017 USVI charter yacht show! Extremely competitive rates on this newer 57' catamaran! Rave reviews for this Captain & Chef! Incredible layout and use of space for a 45' Catamaran! Rave reviews for this crew from numerous Clients over time! BVI Start: Maximize your time in the BVI and enjoy a slightly more leisurely pace by cutting out the necessary travel time to and from Tortola aboard your charter yacht. For a charter in the BVI, you can fly into St. Thomas or Tortola at your choosing. Convenient inter-island ferry services or private water taxis allow you to travel back and forth from St. Thomas to Tortola in a maximum of about 50 minutes one way if St. Thomas flights are preferred. USVI Start: Take advantage of more direct and typically more affordable flights into St. Thomas plus the possibility of a simple taxi ride to meet up with your yacht. A St. Thomas pick-up is possible if your yacht of choice is willing and able to pick-up in US waters. These St. Thomas based US Virgin Island charters typically spend one night off the US island of St. John and the balance of the charter in the BVI. Learn more about USVI charters. The charter was beyond perfect! Words can hardly express how wonderful our entire charter experience with you and Carefree has been! From the very beginning you were so incredibly helpful in answering all of my questions and meeting my entire groups needs. After hurricanes Irma and Maria hit the islands you were so reassuring of my worries and you were right, the Islands are rebounding quickly. It felt great to be there helping out the island economy. Thank you again for helping make my 50th birthday something to truly remember forever! Our BVI sailing charters and luxury motor yachts offer guests a wide array of onboard activities, including sailing, snorkeling, water skiing, wakeboarding, kayaking, stand up paddle-boarding or scuba diving. Learn more about what the charter experience offers. Instead of the British Virgin Islands, consider a charter in and around St. Maarten or the Grenadines, each offering a slightly different flair.